Hope May started with lots of fun in the sun for you. 🙂 Well in Madrid it has been pouring lately, but on the plus side there’s always sunshine afterwards! For today’s post I wanted to share with you my trip to London during the bank holidays. I’ve already been to London in the past, the last time was in 2012. This time, my boyfriend and I decided to check out the food markets and museums. Thanks to my boyfriend’s cousin (who lives in London), we were able to see more food markets this time. I must admit, it was nice to see where the locals ¨eat out¨ and to experience the Londoner’s lifestyle. The first one was The Ropewalk (Maltby Street), where they sold fresh food and it was not to mention cheap. It was the first time I tried steak and chips with chimichurri… Wow… it was de-li-cious! Near the the Ropewalk, eating a yummie boa bun. Aloha! A vintage shop/restaurant. At the the Ropewalk. A Scottish speciality it seems! The best steak and chips ever! The Sky Garden was on top of my list of places to visit. The building is named for its shape as the “walkie-talkie.” If you’re across the Tower Bridge you can see it clearly. We booked the Darwin Brasserie to get a taste of their French cuisine and of course enjoy the amazing views of London. We were fortune enough that the sun was shining brightly. At the end of the day we had the most fantastic sunset. They had an extensive menu and we have chosen to go with the Chopped Chicken & Avocado Salad, the Confit Duck Leg, the Roast Butternut Squash (side dish) and Blackberry & Apple Crumble (dessert). The service was amazing and we had 2 hours to enjoy the meal. After that, we had some time to appreciate the sunset and the ambiance was quite joyful, especially with the live jazz music. Highly recommended! I was so ecstatic to go on top of the Sky Garden (tall building on the left)! Checking out the Sky Garden from the Tower Bridge. On top of the Sky Garden, appreciating the Panoramic view. A nice view of the Shard and the River Thames. The Sky Garden provides a 360-view of London. The Darwin Brasserie inside the Sky Garden. Our feast of the day! Liked this drink very much (signature cocktail). We also visited the Old Spitalfields Market and the Brick Lane Street Market and it had different areas with vintage stalls, street music, food and drinks from different cultures. Furthermore, there were vintage shops and outlet shops in this area. 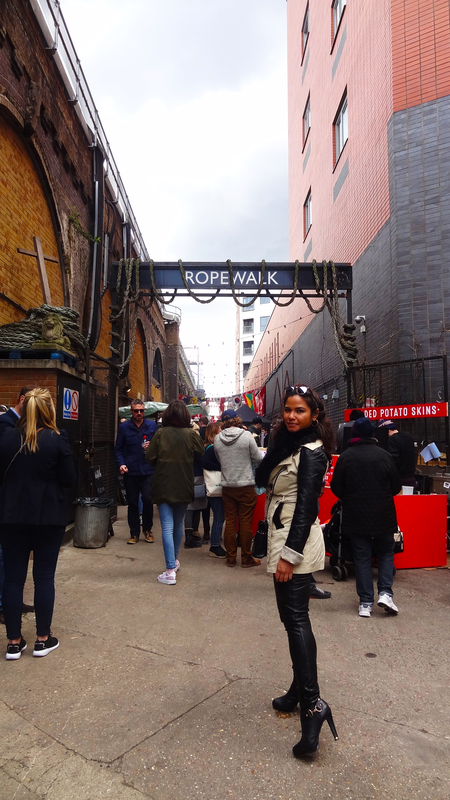 We also visited (the next day) the Old Spitalfields Market and the Brick Lane Street Market and it had different areas with vintage stalls, street music, food and drinks from different cultures. Furthermore, there were vintage shops and outlet shops in this area. Checking out vintage shops, near the Brick Lane Street Market. An area near the Brick Lane Street Market with people enjoying the sun, food, music and more. This place is a must-visit, if you want to get a better understanding of the British history of royal betrayals… hihi.. Seriously there were 22 beheadings because of treason, adultery or other punishable crimes. Anyway I don’t want to get into this. If you ever decide to visit just head to the “free” tour. Our guide was Dickie Dover and let me tell you he sure knows how to captivate one’s attention and explains with such a delight about the occurrences within the castle. After the tour we decided to go to the White Tower for the Royal Armouries collections, and saved the visit to the Crown Jewels for last. Posing with a “Beefeater” or Yeoman Warder (the Queen’s Body Guard). Inside the Tower of London. A guard inside the Tower of London. The White Tower, housing the Royal Armouries collections. Before entering the White Tower. Some of the collections of the White Tower, showcasing the armoury of the line of Kings. For me the best part of the British Museum is the hall, it’s very welcoming. If you don’t have much time on your hands pick up a map, which will provide you with a recommended route/ highlights of the museum. Although it’s called the British Museum, most artefacts were far from British. I felt that some of the artefacts should be displayed in their homeland, especially the Parthenon sculptures from Athens, Greece. They have about 8 million artefacts in their collection… I’m just saying. I truly hope the Greek Government win the legal ownership one day. The main entrance of the British Museum. The museun’s inner courtyard, the Great Court. The Parthenon Gallery at British Museum. A Moai-statue from Easter Island. Sumerian court jewellery from Ur (2500 BC), from early Iraq. For our last museum-visit we booked tickets to see the exhibition of the Wildlife Photographer of the Year at the Natural History Musuem. We took full advantage and managed to skip the long queues. The entrance of the museum is impressive! As soon as you walk into this museum it feels like you’re in the movie of “Night at the Museum“. The photography exhibition itself was fascinating, especially the young photographers (aged 17 or under) were exceptionally good in their work. Click on this link to see the work of some the best photographers of the world (“First Shoots” is dedicated to the young photographers). Entering the Natural History Musuem. This section is like scene from a movie. London has so much to offer for every class. If you’re on a budget it’s advisable to plan/book in advance. Even restaurants get booked very quickly. On the one hand most museums are free, but on the other hand they charge for temporary exhibitions. Hope you’ve enjoyed this travel post.